RC Radio: Welcome to Castle Sandalphon. Castle Sandalphon is a wonderful alchemical place. 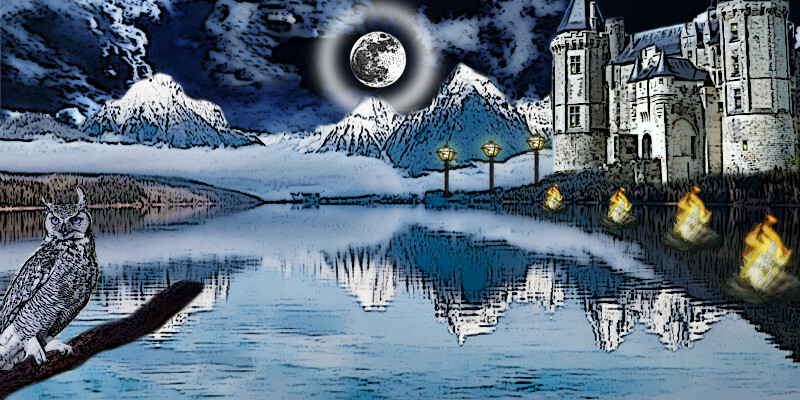 It is full of mystery and depth and contains all sorts of special energies that you would expect to find from a magical mythic castle in the hills. It is unique as the castle captures Sandalphon’s wonderful energy and radiates it back to visitors. It is his gift to the seeker of spiritual knowledge and wisdom. Castle Sandalphon is typically one of the first places a new person to the Tree of Life learning system winds up going to. To have access to the rest of the Tree of Life, you need to meet with Sandalphon and get his blessing. Sandalphon is the personality that presides over Malkuth. He himself was once human and has ascended to its highest form. As such he knows how to be human very well. He can be your greatest guide on your human journey. He is very down to earth in his communication, has infinite love and respect for everyone. Sandalphon is always gentle even when he is helping you to accept some truth that is hard for you to swallow. Your spiritual journey is about change and rebirth. To achieve this transformation from human to divine, there are many beliefs about yourself and the universe that must be transformed and changed. It is the limiting beliefs that keep you from walking into your Ascended body today. 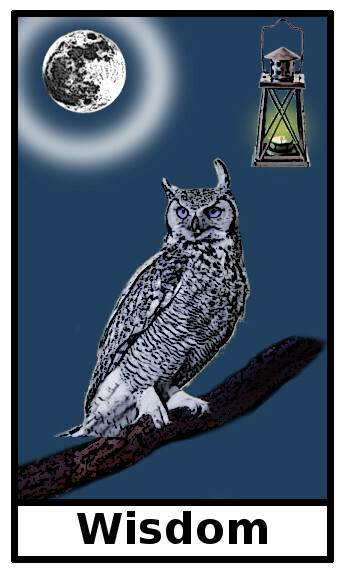 Sandalphon can help you with that journey as he himself has walked this path. It is said Sandalphon was Enoch, Elijah, John the Baptist, and perhaps even Merlin. On his desk within Castle Sandalphon, he has nameplates of all the people he has been in human history. To say that he is the ultimate source of being human, would be an understatement. Sandalphon is typically a male figure, but often appears as a princess for children. He also has some other forms and what form you find him in, often tells you something about your adventure there at that moment. In the castle he usually dons his king or pope form, but be on the look out for his shorts and sandals form wearing bearskin or even Bermuda shorts. He also has a more conventional form of wearing a suit and tie, which he may appear in if he is helping you with business or mundane matters. 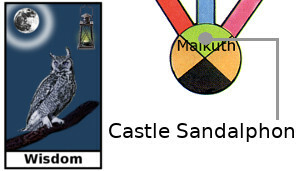 Sandalphon Castle is located just north of the Center of Malkuth. In the distance you can see the mountains where the Crystal Cave/Palace is located. Sandalphon Castle, like HAS, is easy to get to, as they both exist near the earth plane. (You can also meet Sandalphon at HAS and get your blessing to go to the rest of the Tree of Life there, as well). Excalibur Garden @Castle Sandalphon: Located in the center of Castle Sandalphon, this place is full of all kinds of plants in bloom. 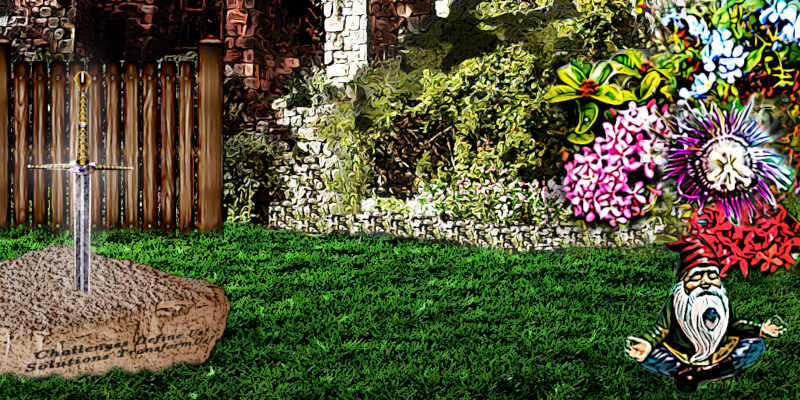 In the center of the garden is a sword inside a stone representing Excalibur from the legend. Under the monument is an inscription. It reads: Challenges define us! Solutions transform us! The garden is an excellent place to go for peace and rest from outside influences in your life. Sandalphon takes great care to make sure the energy is perfectly balanced. Be on the look out for Sandalphon's Gnome helpers in the garden. They can help you with the natural things in life that high tech living may have had you forget. 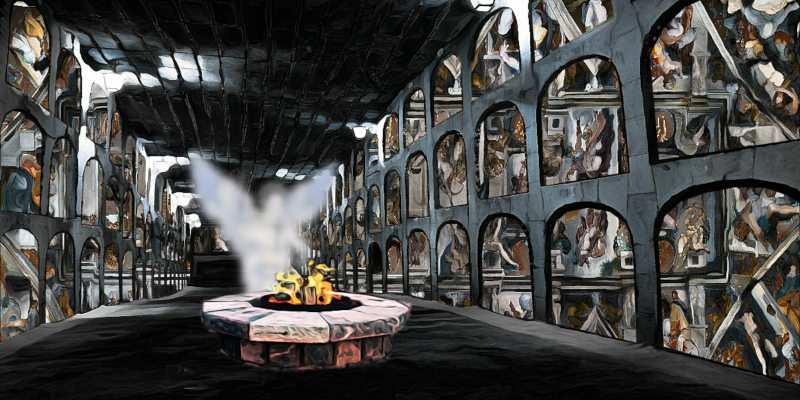 Shrine of Lost Souls: Visit the shrine in the basement of the castle and help the lost souls or people there that are trapped. These people can also be people from your own life that are trapped. You can help them here and that help will transfer over to the physical plane. There are always special rewards for people willing to help others either known or unknown to them, and it can help to balance karma. The Shrine of Lost Souls is really rewarding work. If you get placed on the Honor Guard, then you are really doing well helping lost souls. The honor guard is a group of physical and nonphysical beings that help people cross over from physical reality to nonphysical reality when they die. Some of these are accident cases and the Honor Guard can help a soul that does not understand what has happened. Visit Castle Sandalphon when you need help with human matters or just want some sage advice from the wisest human that every lived. Sandalphon is an expressionist. Many times he does not need to speak. The expression on his face can convey great information to you. Gift: Basic Sword: Used to break up dark energy or entities that attack or become attached to your energy field. This sword is yours and will remain with you always. It will be upgraded along the way on your TOL journey. Gift: Sword of Lost Souls: Given to you for helping lost souls at Castle Sandalphon. It lights the way to spirit, dispels darkness and evil. Gift: Sword of Exicalbur: If your cause is honorable and just, the sword will make you invincible. The sword returns once your task is complete.